Believe it or not, it’s hard to find good Mexican food in New York City. I’ve searched high and low–from ninth avenue all the way down to the Village–and have rarely come across delicious, reasonably priced Mexican food. 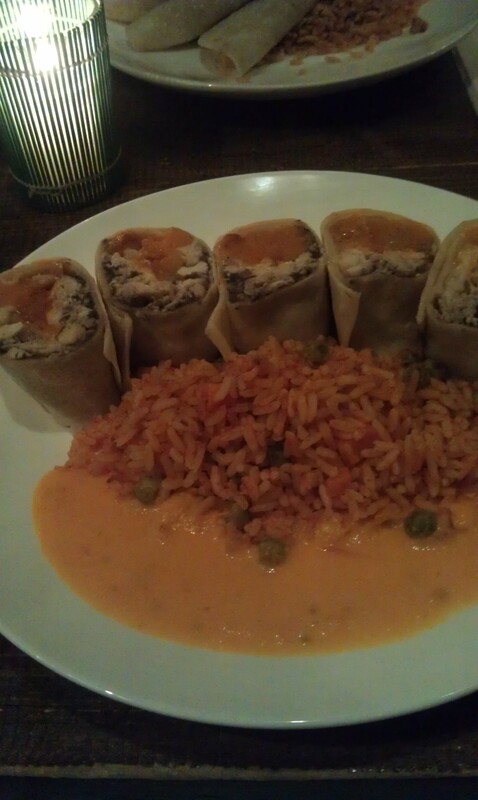 But Mexicana Mama Centro has made me a believer that good Mexican food does exist in Manhattan. My dining partner and I had been to Mexicana Mama Centro another time, when we serendipitously came across it on east 12th. Last night, as with our first night, we ordered the Queso Fundido as an appetizer and two classic margaritas to drink. 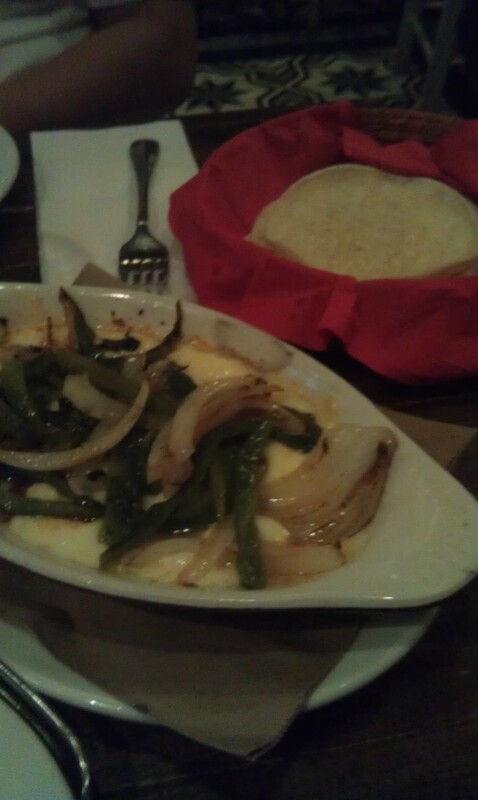 The Queso Fundido was beyond delicious. Accompanied by six small round corn tortillas, it’s a casserole full of melted (chihuahua?) cheese with sauteed onion and bell pepper on top. Wow. We put huge dollops of the cheese mixture onto our little tortillas and rolled them as we would burritos. Outstanding! And the margaritas were pretty good, too. I asked for salt on the rim of mine (dining partner did as well) and the salt mixed nicely with the tang of the margarita. For entrees, my dining partner ordered the special spicy fish tacos while I got the chicken burrito. I know, not taking any risk there, right? The spicy fish tacos were incredible. I couldn’t tell what kind of fish it was (an expensive one, according to our bill), but the filet was chopped up and mixed with a handful of spices on thin tortillas. Delicious! My chicken burrito was nicely plated and quite delectable, too. An interesting addition, the chicken burrito had Mexican potatoes which tasted somewhat sweet within the tortilla. The burrito also had chihuahua cheese and black beans inside. Originally, I was served an enchilada and started eating the Mexican rice that came with it, but found, just a few moments later, that the enchilada belonged to my dining neighbor. Good thing I took a moment to take a photo of the enchilada before diving in! We didn’t get dessert this time around, but I trust that anything Mexicana Mama Centro serves up is nothing but top-notch. Do try it if you’re in the area–or even if you’re not! Take the N/Q/R/4/5/6/L to 14th Street-Union Square and walk south two blocks. You can’t miss Mexicana Mama Centro’s high-flying flag outside its facade!